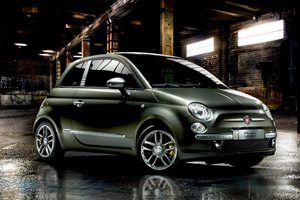 Fiat-Chrysler announced that the company will build an all-electric car based off the Fiat 500 by 2012 and a plug-in hybrid Ram by 2011. The Fiat 500EV was revealed earlier this year at the North American International Auto Show, but details are still scarce on the car. What is known is that the 500EV is co-developed by Chrysler and Fiat. The engineering work will be done at the Chrysler Group headquarters in Auburn Hills, Michigan and not in Italy. The 500EV will run off a lithium ion battery, but the current range is unknown. It’s possible for the 500EV to have a range of 60-100 miles. Last year a Swedish company named Adapt converted Fiat 500′s to electric. The company claimed an almost 125 mile range for their Fiat 500 conversions. Unfortunately the electric 500′s Adapt produced cost almost $50,000. Chrysler has said the 500EV will be priced competitively for an electric vehicle of its size. The 500EV will likely be in the same price range as Nissan’s Leaf, which will have similar specs. Pricing will be withheld until the car comes closer to production. It’s great to see Chrysler Group LLC get into the electric game, but the U.S. taxpayer will still have to foot part of the bill. The $48 million grant will help Chrysler develop plug-in hybrid vehicles in the future, but it’s disappointing to see the company funnel the money into a truck. Each of those 140 plug-in Rams will indirectly cost tax payers $340,000 to produce. Perhaps the money would of been better spent to help develop a Chevy Volt competitor? Demonstrating a test fleet of plug-in hybrids in 2011 is too little, too late. Most writers do not explain Federal law demands US carmakers to make a ZEV by a certain date; electric cars are not a mere novelty. GM and Chrysler both warred California in the courts from about ’98 to ’07 over Federal emission credits for electric cars. Since GM’s EV 1 became illegal, they crushed them. So Cal did prevent US consumers from having electric cars! And… California went bankrupt instead. Check the dates for yourself. Hence, since GM and Chrysler battled Cal on behalf of Federal law, what is commonly called a bailout by all the talking heads is rather more accurately called compensation. Swartzneger people ended the Cal electric car battle by passing certain laws, late ’07? -They passed legislation to help Tesla Motors also.